Creating a money-making online venture is not a simple challenge. Market Samurai ($150) is a comprehensive suite of tools aimed at making the process easier by helping you track down lucrative keywords, buy the right domain for the job, and more. To start a Market Samurai project, you must pick one "main" keyword. Some applications can be mastered (or at least learned) just by playing with their different parts; Market Samurai is not one of them. Market Samurai is a large application, divided into eight modules: Rank Tracker, Keyword Research, SEO Competition, Domains, Monetization, Find Content, Publish Content, and Promotion. Some of the modules display tabular interfaces brimming with arcane acronyms like RDD, DMZ (it's not what you think), and my personal favorite, BLEG. Thankfully, you can hover over a column header to get a more complete definition of what it means, and there is also an online glossary. Hints and tooltips are nice, but the online documentation is absolutely essential. It is made up of a series of videos, each no longer than 15 minutes. The videos are well produced, with clear, calm narration, and very little techno-babble and jargon. Explanations are clear, and are as much about Internet marketing in general as they are about the application itself. The only point of confusion was that Market Samurai's interface has changed since the videos were made, and I was not always able to follow the procedures exactly as shown. 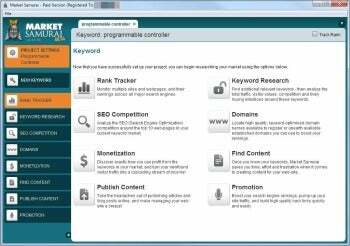 Market Samurai offers a host of tools for optimizing and monetizing keywords. Market Samurai is very different from most software in that it assumes a specific workflow. Microsoft Word doesn't care what document you're writing or in what order you like to write; Market Samurai doesn't care what market you're researching, but it cares deeply about the process. The application was built around a set of four assumptions called The Golden Rules: Search terms must be (1) relevant, (2) high-traffic, (3) not too competitive, and (4) "commercial" (meaning, people search for them with the intent to buy something). Assuming you get all four right, you should have an Internet marketing hit on your hands--or so the theory goes. Market Samurai contains tools to let you assess each of these metrics for the keywords you choose. Using Market Samurai's Rank Tracker module is not a good idea: even the application will tell you so. In practice, even after watching more than an hour of documentation, using the application was not a silky-smooth experience. The very first module, Rank Tracker, popped up scary warnings: Google doesn't like it when robots submit search queries, and using Rank Tracker may raise alerts and force you to answer CAPTCHA prompts when you try to use Google later from the same IP address. Worse still, this could happen to other users on your network, too, because they share your external IP address. The same thing happened when I used Link-Assistant.com's competing product Rank Tracker--at least Market Samurai gave me clear warnings. Market Samurai's Keyword Research module was more promising. To use it, you must have a Google AdWords account, which you can open for free. This module can be used to extrapolate many keywords out of a small initial set, much like you can do for free using the Google AdWords Keyword Tool, but it then proceeds to evaluate those keywords using several custom metrics to help you decide if they're worth targeting. Market Samurai's SEO Competition module lets you see at a glance how established the competition is for a given keyword. Once you have a keyword you want to rank for, the next step is to see how well-established your competition is. In other words, if you're trying to rank for something like "car insurance," you will have to defeat some very established competitors with deep pockets on your way to the top. Market Samurai's SEO Competition module lets you see who is currently ranking for the first ten results of a term, along with metrics about each competitor that indicate how firmly established they are (how many links point their way, etc.). Results are color-coded, so you can see at a glance how difficult or easy a term would be to rank for. Other modules are equally technical, and include tools for helping you pick a good domain name and publish ads or find affiliate products to promote on your new website. The only ones I would advise you to beware are the Find Content and Publish Content modules. While Market Samurai's documentation stresses the importance of creating your own original content, these two modules make it very easy to copy and republish other people's content on your own blog without permission: Not a good idea. You can use Market Samurai to find a good domain name for the keyword want to rank for. Online marketing is an increasingly complex industry, but the Market Samurai suite handles this complexity well for the most part. Although some modules are more useful than others, the suite itself helps you understand which ones are likely to help you the most. Used intelligently, I can see how Market Samurai could help an entrepreneur find lucrative keywords and make real money online. 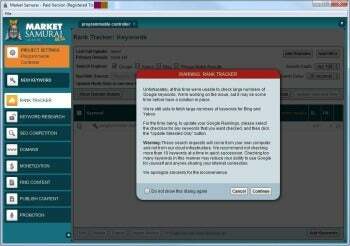 Finding search terms worth ranking at search engines with the Market Samurai suite of tools.